Food Endeavours of the Blue Apocalypse: Panna Cotta Lamingtons – The Best Lamingtons You’ll Ever Make! Panna Cotta Lamingtons – The Best Lamingtons You’ll Ever Make! There are very few desserts that Australia can claim as its own. We talk up pavlovas but it is fraught with arguments over if it was invented in Australia or New Zealand. New Zealand appears to win on this front but it doesn’t stop Australia from treating it like its own. 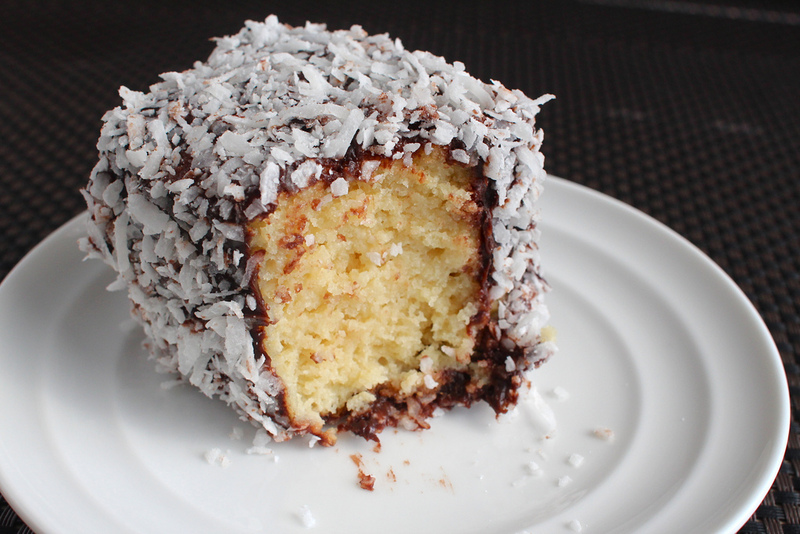 Lamingtons are something that Australia can definitely claim as its own. It was invented around the 20th century in the kitchen of Baron Lamington, the governor of Queensland. 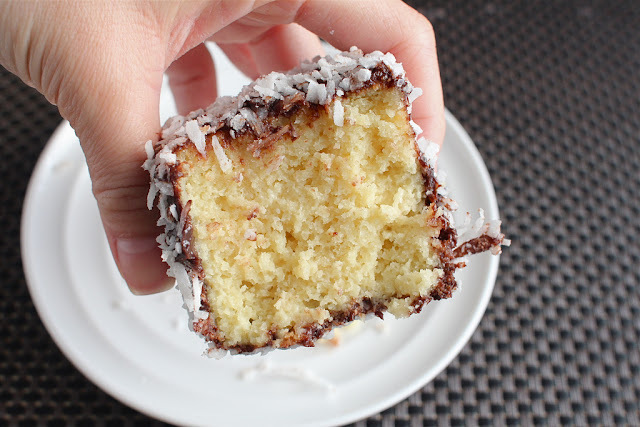 Legend has it that it came about when stale sponge cake was covered with chocolate and coconut as something to offer to visiting dignitaries or another story is that a maid accidentally dropped cake in chocolate and was ordered to cover it in coconut to make it less sticky. I made lamingtons with a modern twist for the Secret Cake Club Perth in May where the theme was classics. Lamingtons are a classic Aussie icon. Someone at cake club told me that it was the first time he had eaten a lamington and my response was “What is wrong with you? !” but that statement was retracted when I later found out that he was from Ireland and had only been in Australia for 1.5 years. 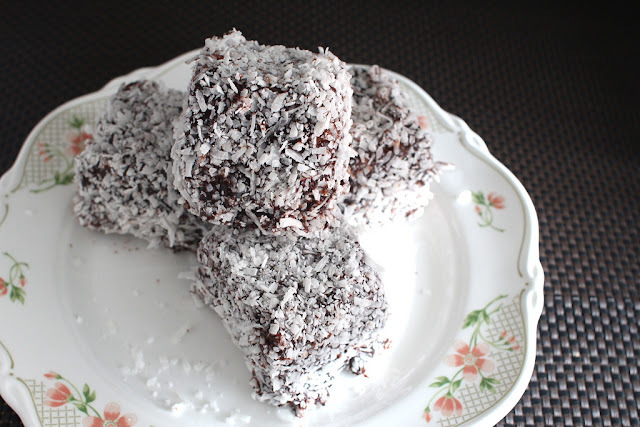 If you grew up in Australia, lamingtons would be a part of your psyche. Mass produced commercial supermarket lamingtons were a lunchbox staple and schools always had Lamington Drives as a fundraiser. The lamingtons I made for Secret Cake Club were panna cotta lamingtons – sponge cakes soaked overnight in a panna cotta mixture and then covered with chocolate ganache and moist coconut flakes. These were not the kind of lamingtons I grew up eating. The lamingtons I’m used to had a sponge which would be a bit dry (possibly stale), and was covered in some chocolate icing mix (ie: not real chocolate) and dessicated coconut. I was first introduced to panna cotta lamingtons on Instagram where many people that I followed in Sydney kept posting photos of this amazing lamington that they ate at Flour and Stone. When I was over in Sydney last November to see Radiohead, I made a point of visiting Flour and Stone to see for myself what all the fuss over this lamington was about. After all, it’s just a lamington. I had not eaten a lamington in ages, it was not something that got me excited or interested me when there are always so many other great sweet treats on offer. When I ate the panna cotta lamington from Flour and Stone for the first time, I got it. I totally understood why people were raving about it – the sponge had a soft and creamy texture from being soaked with panna cotta, it was filled with a raspberry compote, and covered in real chocolate and flakes of coconut. 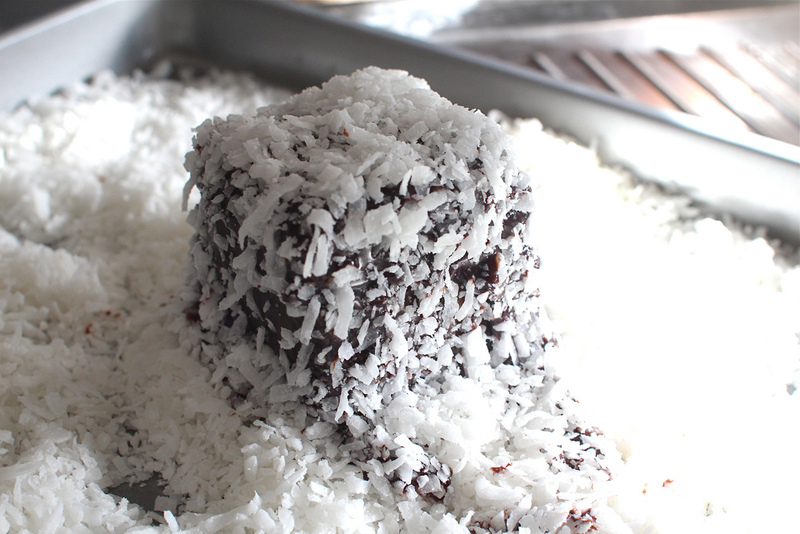 The classic lamington had been turned into a decadent dessert and it was real pleasure to eat. So when the theme for Secret Cake Club was classics I wanted to try making panna cotta lamingtons. I figured that I would just have to find a lamington recipe and a panna cotta recipe, and combine them together somehow but this did not have to happen as the recipe for the panna cotta lamingtons at Flour and Stone is available online. 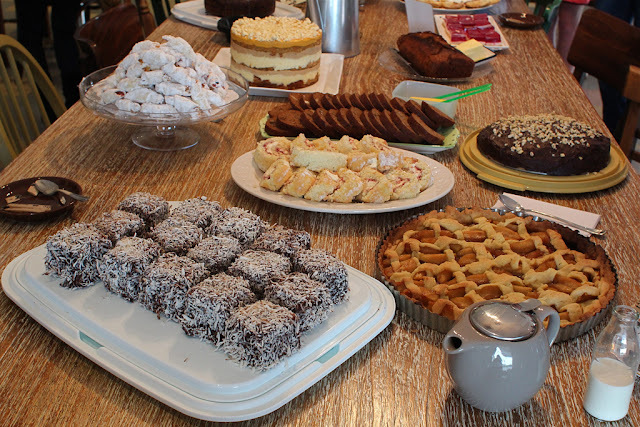 The owner and baker of Flour and Stone, Nadine Ingram has shared it! I decided to follow the recipe and see how I would go but I didn't have two 8x12 inch cake pans as specified in the recipe so I just used one large 20x30cm baking pan. The original version at Flour and Stone sandwiches two squares of sponge cake with raspberry compote but as I was baking it in one larger pan, the resulting sponge was a bit taller than what it should be so I decided to skip the raspberry filling. I made the quantity of panna cotta specified which contained 4 ¼ cups of cream but it looked too much and I only added in half of it, and poured the rest into little cups to set as individual panna cottas. Rather than making the chocolate icing in the recipe I made a simple chocolate ganache to coat. So much for following a recipe…I just adapted it to my liking along the way! So this is my take on the panna cotta lamingtons from Flour and Stone. Panna Cotta soaked sponge cake. Love the soft and creamy texture! Note: Cake flour is not available in Australia but I found some in an Asian supermarket. Cake flour delivers a more delicate and tender crumb for cakes. 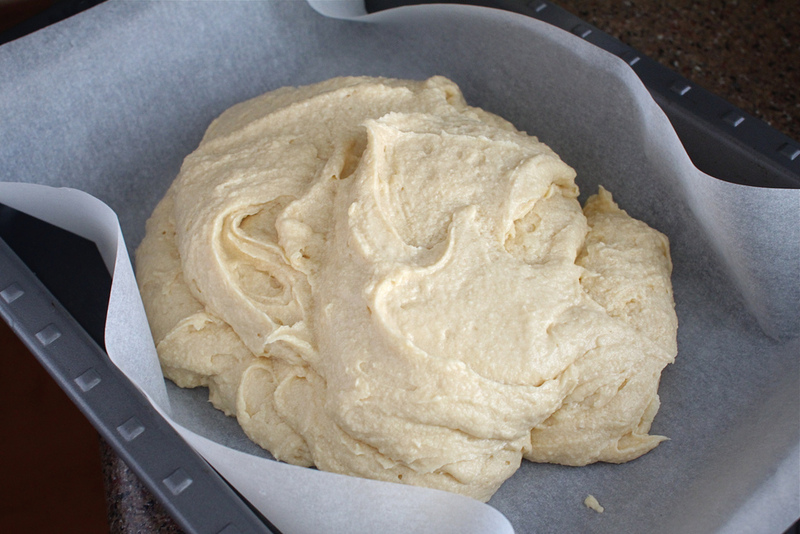 If you can’t find cake flour, an appropriate substitute is to mix together flour with some cornflour. For every cup of flour, take out two tablespoons of flour and replace with two tablespoons of cornflour. Sift the flour and cornflour together a few times to incorporate well. Preheat oven to 175C. 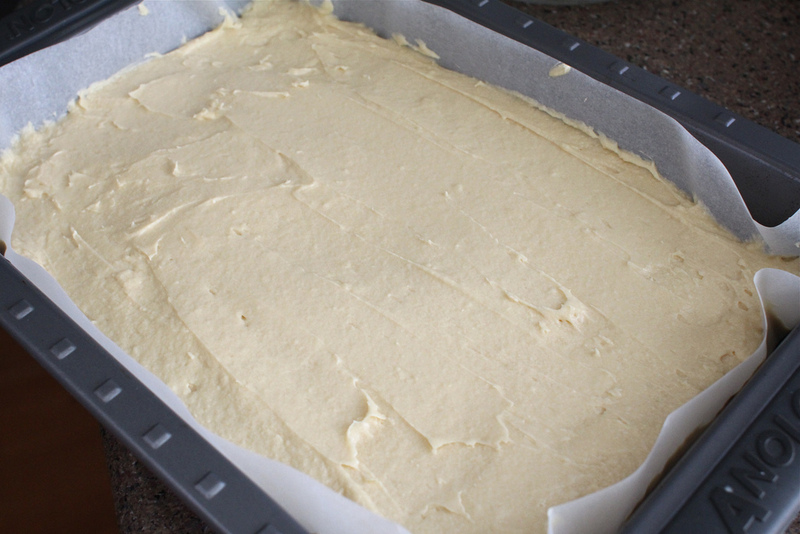 Line a 20x30cm baking pan with greaseproof paper. Mix the cake flour and baking powder together and sift three times. In a large bowl, beat the butter and sugar together until light and fluffy, about 10 minutes. Then gradually add the eggs in and beat until fully blended. Use a spatula to gently fold in the flour and milk alternately until the batter is smooth. (This can also be done with a mixer on low speed. I have a hand held electric beater which doesn’t have a low speed so at the end of folding in the flour and milk, I beat the mixture for ~10 seconds to fully incorporate everything and smooth any lumps). Pour the batter into the lined pan and bake for about 30 minutes, until a skewer inserted in the middle comes out clean and the middle of the cake bounces back when pressed with finger. Soak the gelatin leaves in cold water to soften. Place the cream and sugar in a saucepan. Use a knife to split the vanilla bean in half and scrape the seeds out, add the seeds and the beans into the saucepan (alternatively, just add 1 teaspoon of vanilla extract). Stir and warm over low heat until sugar has dissolved, then just bring to the boil before removing from the heat. Remove the gelatin leaves from the water and squeeze any excess water from them with your hands. Remove the cream mixture from the heat and add the gelatin leaves. Whisk well until all the gelatin leaves have melted. Strain through a fine sieve and leave at room temperature for an hour. Once the sponge cake has cooled, use a skewer to poke holes all over it and use a small knife to slice the cake into square portions (4-5cms) but only cut halfway down into the cake (I find that this will allow more of the panna cotta to soak through evenly). Pour the panna cotta mixture all over the sponge. The next day, remove the sponge from the pan and slice into 4-5cm squares. Prepare the chocolate ganache coating - combine chocolate and cream in a heatproof bowl over a saucepan of gently simmering water. When chocolate begins to melt, stir gently until combined and smooth. Set aside. Scatter the coconut flakes over a tray. Using 2 forks, dip each square into the chocolate ganache and shake to remove the excess. (If the ganache starts to thicken, place the bowl over gently simmering water to thin). Cover the chocolate square in coconut, shake off the excess and place on a wire rack (sitting over a tray). Repeat with other sponge squares. Stand for at least 1 hour or until the chocolate sets. Thanks Simon :) I'm happy that I can have panna cotta lamingtons now whenever I want but I still have to fly over to Sydney for the best ramen! Thanks Lizzy :) I wish I could home deliver but I'm not sure if these lamingtons will survive Australia Post! The Flour and Stone lamingtons are amazing and they combat the usual issue I have with lamingtons where they're slightly dry! After all this time in Australia, I have never made lamingtons. Not every crappy ones. These look so good! Wow... These just look super moist :) Fantastic :D Must get to a Secret Cake Club meet one day too. I love Flour & Stone...I go there most saturday mornings and they are the cause of my very bad habit of eating cake for breakfast on Saturdays! All their cakes and pastries are so good. Their apple tart is fantastic, and lately they have been doing an apple and quince tart. Mmmmm... Must try this recipe, thanks for sharing it. Have you ever tried tres leches cake before? 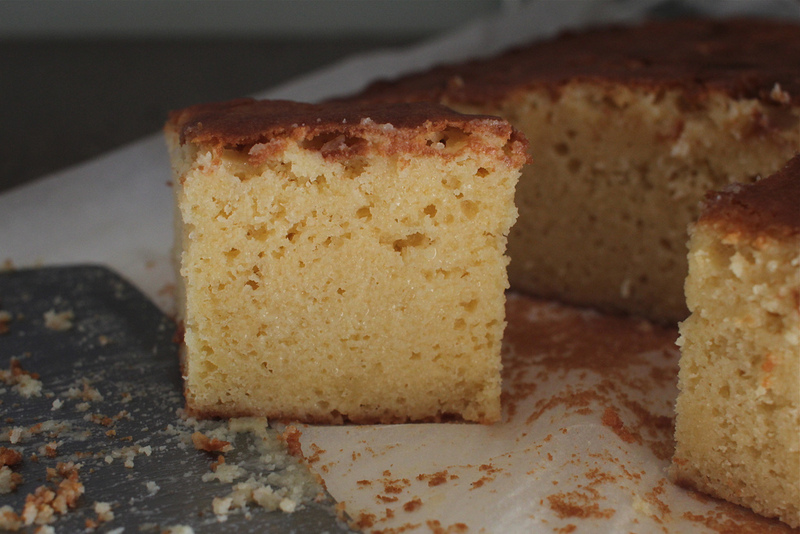 If you haven't, it's a Mexican dessert of sponge cake that's been soaked in a combination of whole milk, evaporated milk, and sweetened condensed milk. This panna cotta lamington technique sounds very similar to that! And from the way you described the end product (creamy, soft), it has a similar texture too. I will be sure to try these out! Hello :) Thanks for your comment, I haven't had tres leches cake before but it sounds amazing!! I love sweetened condense milk so I'll have to try making it. Gonna look for a recipe. These are really beautiful! Adam Roberts just posted this link via his blog (Amateur Gourmet) and I am so grateful that he did! I cant wait to try making these...I will just need to buy a scale to do all the measuring. Also, I have never heard of a gelatin leaves, I will need to hunt those down. So glad to have been shown a new food blog to devour! 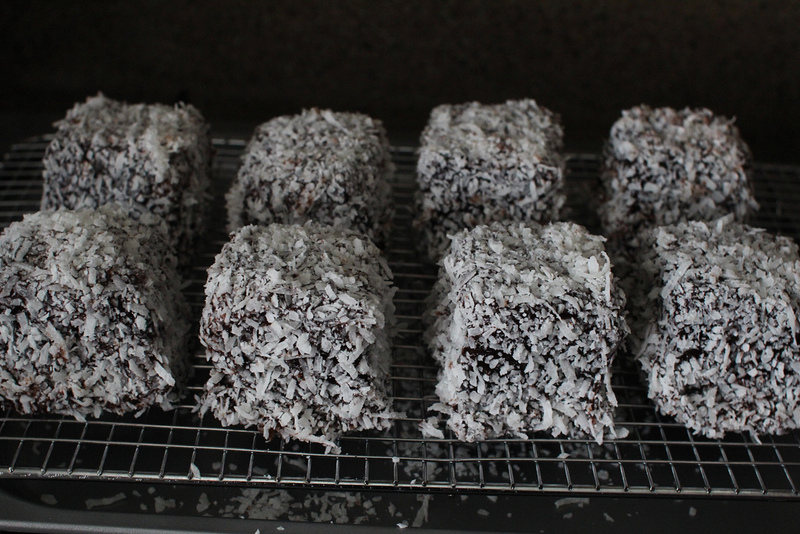 Thanks for dropping by :) Glad you liked the sound of panna cotta lamingtons, they are pretty awesome! Thanks Ai-Ling, yes I use the powder. appreciate the link! will check that out. hey Ai Ling, thank you for this recipe. May I know how long can I put this outside? I'm planning to bring them to my dears at training but we'll probably be only able to get to these treat days after 2 hours. Hi Ai-Ling. Thank-you so much for this recipe. It looks wonderful and I think I will be trying them out tomorrow. One question though. The inside of the lamingtons shown in photos 2 and 4 looks much fluffier than the one in photo 10 also showing the inside. Did you use half or 3/4 of the panna cotta mixture for the cake shown in the 2nd and 4th photos? I, too, am afraid of over-soaking a beautiful sponge so how much of the panna cotta mixture would you recommend I pour over the cake? My mum loves lamingtons and (being a good daughter that I am - well, most of the time) I am thus on my search for the best lamington recipe. I think your adapted version just might be it. All the photos were taken with 3/4 of the panna cotta mixture. 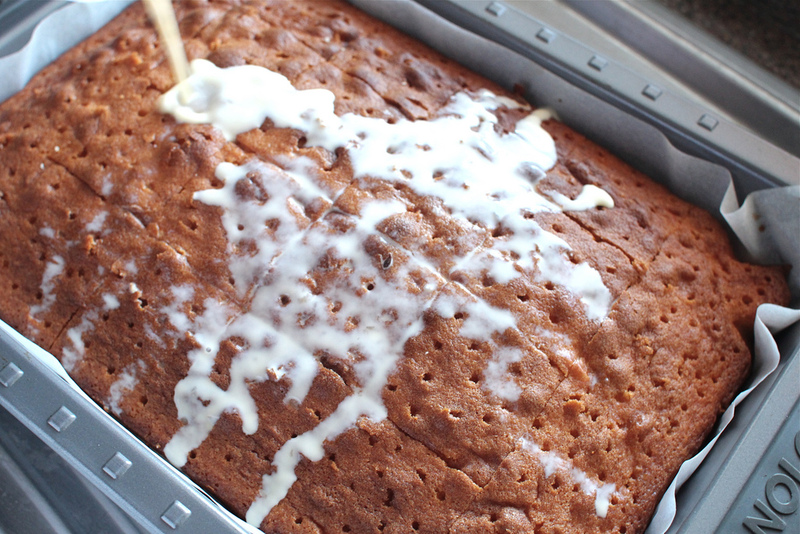 Depending on where the sponge is situated in the cake tin, some will be more moist than others. For example, the cake around the edge of the tin tends to be a little drier and in the middle it is more wet. Just got to make sure you poke lots of holes and pour the panna cotta mixture over evenly.